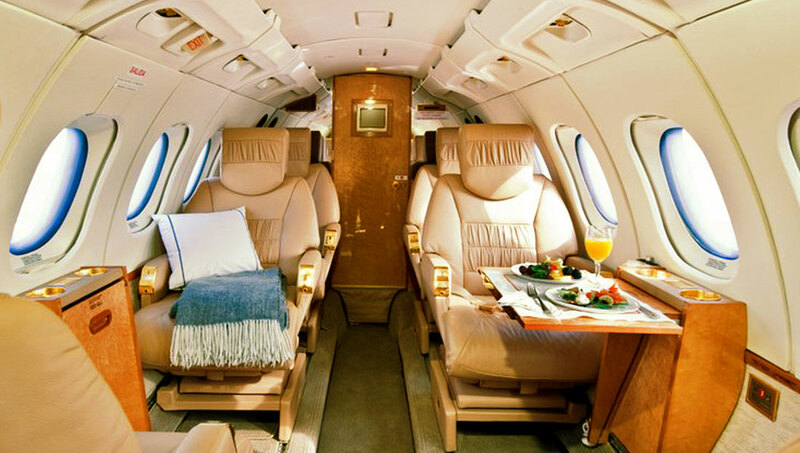 The Hawker 700, made by Raytheon, has a grand interior cabin making it a frequently requested aircraft for corporate and leisure charter. Able to accommodate eight passengers in luxury, the cabin is equipped with a full lavatory and a galley. The 700 travels at over 420 nautical miles per hour and with a range of 2000 nautical miles or over 5hours of nonstop flying at 41,000 ft. The Hawker 700 and 800 series is one of the world ‘s most popular a mid-size twin-engine corporate aircraft. In an increasingly on-demand world, we make your complete traveling experience simple and enjoyable. With one call and as little as an hour's advance notice, you are guaranteed a fully prepared aircraft - where you want, when you want. You don't have to worry about typical airport delays like ticket counters, baggage checks and security checks and long check in times. Inside, the cabin is a luxurious haven from stress. Rich materials and impeccable craftsmanship create an environment that is pleasing to the senses. A clean design and efficient use of space provides a comfortable place for 8 passengers to stretch out and relax. Plus, a variety of refreshments and personal communication devices are at your disposal. Modern day technology and luxuries of communication are only a touch button away. And best of all, you have the ultimate freedom and flexibility to fly directly to remote locations, and airports, which are close to the city and your destinations.